Altamira guitars are the finest quality Gypsy guitars produced in Asia. They are produced in a small artisanal workshop by a skilled team of luthiers lead by the celebrated guitar maker Hanson Yao. 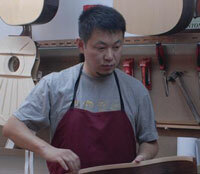 Yao, who apprenticed at the legendary Rodriguez workshop in Spain, is a deeply experienced luthier with an intimate knowledge of both classical and Gypsy guitar design and construction. Yao’s instruments are used world wide by some of the world’s foremost professional Gypsy and classical guitarists, most notably by John Jorgenson who performs regularly with an Altamira guitar and has used one on several of his recordings. We are the North American distributor for Altamira and welcome dealer inquiries. Posted by meshugy on May 15, 2014 at 5:04 pm in Uncategorized. Making a rosewood Bridge...and looking at reducing mass by hollowing out! !